오설록 스페셜 세트는 감사의 달인 5월, 한 달간 온라인상에서 블렌딩티를 구매하는 고객을 위해 디자인된 고객 서비스 차원의 상품 구성 패키지입니다. 심플한 텍스트 중심의 텀블러 그래픽은 남녀노소 누구나 사용할 수 있으면서 선물을 받는 고객에게 간결한 메시지를 전하기 위함입니다. 패키지 그래픽은 감사의 달의 주요 요소인 카네이션, 오설록을 상징하는 딱따구리 그래픽으로 하트의 형태를 만들었고, 그 안에 텀블러 그래픽과 동일한 메시지를 적었습니다. 판매를 위해 제작된 상품이 아닌 서비스 차원의 상품이라는 것을 알려주고자 누구에게나 감각적인 선물이 될 수 있는 브랜드임을 그래픽으로 표현했습니다. 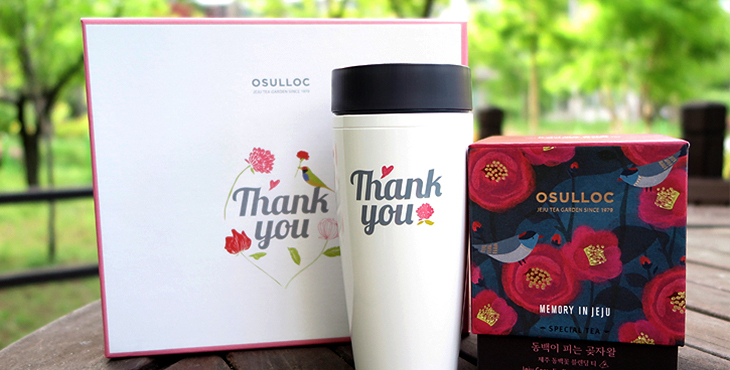 OSULLOC Special Set is a product package at the customer service level that was designed for customers who buy blending tea online in May, the month of gratitude. The tumbler’s graphics, made of simple text, are good for both men and women of all ages, and deliver a simple message to those who receive the product as a gift. 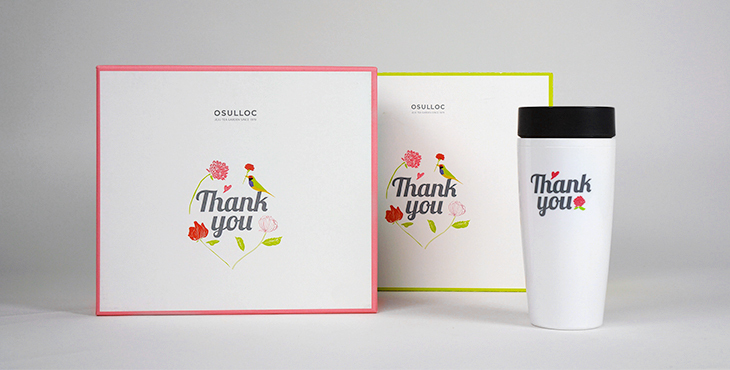 As for the package graphics, I used carnation, the key element of the month of gratitude, and a woodpecker, that symbolizes OSULLOC, to form a graphical heart shape, and the same message as that of the tumbler graphics is written inside it. To notify the customer that the product is not for sale but is a service good, I added in the graphics that this brand can be a sensible gift for anyone.